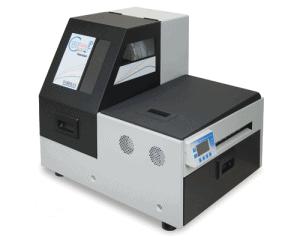 Digital Color Printer for Labels. Prints crisp documents and brilliant color labels at up to 60 pages per minute. Take advantage of the affordable FORMAX ColorMaxLP Digital Color Printer. The FORMAX Color Max LP color printer model prints crisp documents and brilliant color labels at up to 60 pages per minute, measured in 12″ lengths. Utilizing the very latest in Memjet® inkjet technology, it can produce full-color CMYK 1600 dpi output on a variety of label stocks and styles such as gloss, semi-gloss and matte with full-bleed capability on media up to 8.5″ wide. Imagine the flexibility of printing your shipping labels along with color shipping documents, all in one productive workflow. Highlight color on your labels? Sure! You can even print beautiful photography with this unit. The Memjet® print head has no moving parts and 70,400 ink nozzles. This technology offers the user benefits of higher speeds, lower ink and maintenance costs, and the ability to print up to 1600 x 1600 dpi at a page (12″) per second / 60 feet per minute or 60 PPM. The ColorMaxLP color printer can begin printing in under 10 seconds, and its high-capacity 250ml ink tanks (two provided for black) allow for production printing of longer uninterrupted print jobs. There are three modes of output — roll-to-roll, roll-to-cut, and print & hold — which allow users to choose the most convenient option for their particular job. Standard features include: an integrated roll unwinder which is enclosed to protect against dust, LCD control panel, built-in automatic cutter, Bartender label design software and easy-access service bays for ink cartridge replacement. Optional features include: an automatic roll-to-roll rewinder, color matching software, a variable data printing module, and a convenient adjustable-height cabinet.